When I was asked to test these two cartridges, my ears pricked up, as I’ve been hearing great things about both their performance and value for money. Hana cartridges are produced by Excel Sound Corporation, a Tokyo-based manufacturer specialising in handmade Moving Coil (MC) cartridges. The company has been supplying OEM cartridges for half a century (though for which brands remains a closely guarded secret) and now offers a range of low- and high-output cartridges. 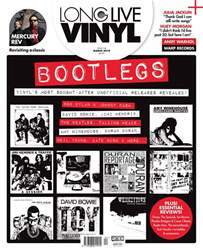 Issue 24 of Long Live Vinyl is now on sale! Join us as we uncover vinyl’s great lost albums – the 40 essential bootlegs and live records that never got an official release. From David Bowie to Bob Dylan, Johnny Cash, Kraftwerk, Amy Winehouse, Jay-Z and The Beatles, don’t miss our definitive guide. Elsewhere this issue, Mercury Rev tell us about revisiting Bobbie Gentry’s lost classic, The Delta Sweete, and we speak to Julia Jacklin and Fun Lovin’ Criminal Huey Morgan about their brilliant new albums. 1980s pop mastermind Trevor Horn talks us through the 10 records that shaped his remarkable career, we meet the punk labels who are redefining the future of vinyl, celebrate Warp Records’ 30th birthday, look back at the work of the great Andy Warhol, and pay tribute to our Classic Album – The Flying Burrito Brothers’ The Gilded Palace Of Sin. If all that’s not enough, you’ll find the most comprehensive range of new album, reissue and gear reviews anywhere on the newsstand.